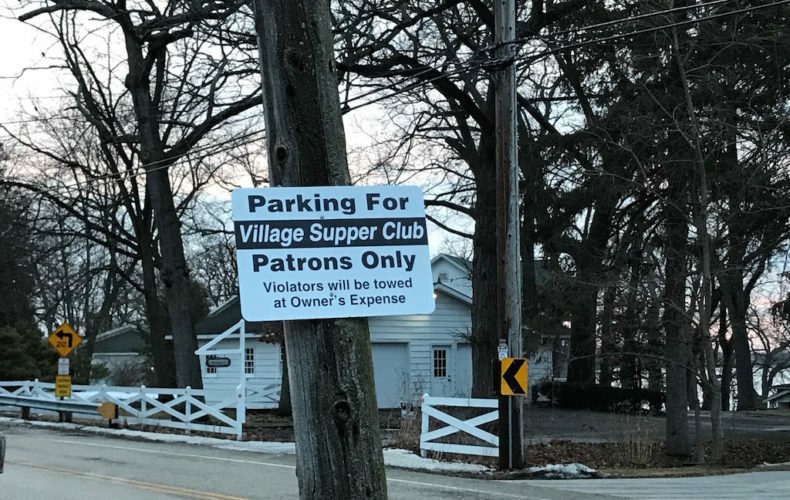 From Friday to Friday, one side of Delavan Lake to the other, I turned into the parking lot at the Village Supper Club at 5 pm sharp. Early, you say. Necessary, I reply. The prior week I tried to eat here at 6 pm but was faced with a 30 minute wait, so I made a concerted effort to arrive early. Such a popular place for Friday fish must be worth that minor sacrifice. 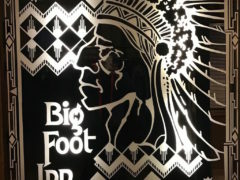 This is a supper club, much in the same vein as Anthony’s or the Big Foot Inn. The foyer is dark, a requirement of supper club design. If you invite me to your supper club and the foyer is brightly lit I’m going to suggest what you’ve actually got there is a restaurant, not a supper club. The hostess was pleasant and walked us past the bar, around a salad bar, and to our table in the front room, facing the lake. There are a series of dining rooms here, but only two face the water. 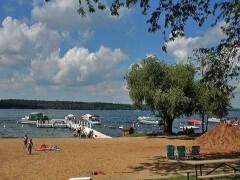 That’s where we were seated, with a nice view of Delavan Lake. The waitress quickly brought our waters and I inquired about the fish fry. She was a pleasant woman, and excitedly told us about the fish. She knew what we wanted. $13.75 for all you can eat fried cod, served family style. Broiled is single serve. Choice of potato pancakes or french fries, along with the usual sides. The kids fish fry was only $9.25. I ordered the fried cod, with a side of broiled, and that, was that. There’s nothing much to consider when seated at the Village Supper Club awaiting your fish. So we spent a few blank minutes and were quickly presented with our dinner. It almost felt like we received our food too quickly. Without any delay there is no anticipation, without anticipation there are no pangs of developing hunger, without hunger there is no relief. 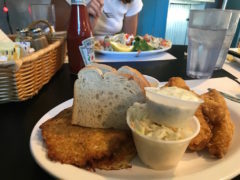 A heaping plate of fried cod, a side of broiled cod, a plate of potato pancakes, some fries for the kids, applesauce, tartar sauce, coleslaw, along with a sliced loaf of bread. At first blush the fish looked good, the potato pancakes looked odd, and the bread sported the tell-tale blistering that results from some time spent in the microwave. I was immediately drawn to the unique potato pancake. It was pillow shaped, fried to a quite dark brown, and softer than a typical pancake. The texture of the potato was not shredded, but rather riced, creating a mouthfeel not at all like a potato pancake. It was oddly sweet, and I couldn’t quite tell if I was eating a potato pancake or some sort of hush puppy with some potato bits thrown in. That distinction shouldn’t ever be blurred. Excepting Pier 290’s dried out saw-dust pancake, this was my least favorite pancake I’ve eaten this year. Perhaps it’s an acquired taste, but I have little time to spend suffering through that acquisition. The fried cod was good. The batter crunchy, the filet appropriately shaped. I didn’t mind the fried fish. The broiled piece was a thick rectangle served with a side of drawn butter and a lemon wedge. I will always appreciate a pot of butter on my plate, no matter how tough and bland the cod might be. And the cod was both. The bread, with those microwaved skin blisters, was chewy, as microwaved bread tends to be. The flavor was good, but how can you expect me to enjoy this sort of bread served with cold foiled butter? You can’t, and I didn’t. The applesauce was bland and too smooth. The tartar sauce, my wife said, was fine, but a bit sweet. We didn’t ask for seconds of anything, and within 30 minutes the whole ordeal was over. Two adult fish fries, two kids fish fries, and a side of cod ($1.95): $60.59 with tip. While we walked out a steady stream of hungry patrons poured in. Do these people not know what good fish fry tastes like? Are they unaware that a much better dinner exists on the other side of that shallow lake? When it comes to fish fry, often tradition takes first place in deciding where to go. Tradition can outweigh good food any day of the week, especially on a Friday. Thankfully I have no tradition to obstruct my objectivity. The restaurant is blah. It’s a classic supper club, but it isn’t quite dated enough or cheesy enough to win my affection. The fried cod was meh. It wasn’t bad, but it wasn’t good. The potato pancake was more a potato hushpuppy, and I cannot abide such an interpretation. The bread was blah, the butter foiled. The applesauce? Blah. The Village might be one of the most popular places to eat fried fish on a Friday in Wisconsin, but that Friday visit will count as my first and my last.